Perturbed Endoplasmic Reticulum (ER) calcium (Ca2+) homeostasis emerges as a central player in Alzheimer disease (AD). Accordingly, different studies have reported alterations of the expression and the function of Ryanodine Receptors (RyR) in human AD-affected brains, in cells expressing familial AD-linked mutations on the β amyloid precursor protein (βAPP) and presenilins (the catalytic core in γ-secretase complexes cleaving the βAPP, thereby generating amyloid β (Aβ) peptides), as well as in the brain of various transgenic AD mice models. Data converge to suggest that RyR expression and function alteration are associated to AD pathogenesis through the control of: i) βAPP processing and Aβ peptide production, ii) neuronal death; iii) synaptic function; and iv) memory and learning abilities. In this review, we document the network of evidences suggesting that RyR could play a complex dual “compensatory/protective versus pathogenic” role contributing to the setting of histopathological lesions and synaptic deficits that are associated with the disease stages. We also discuss the possible mechanisms underlying RyR expression and function alterations in AD. 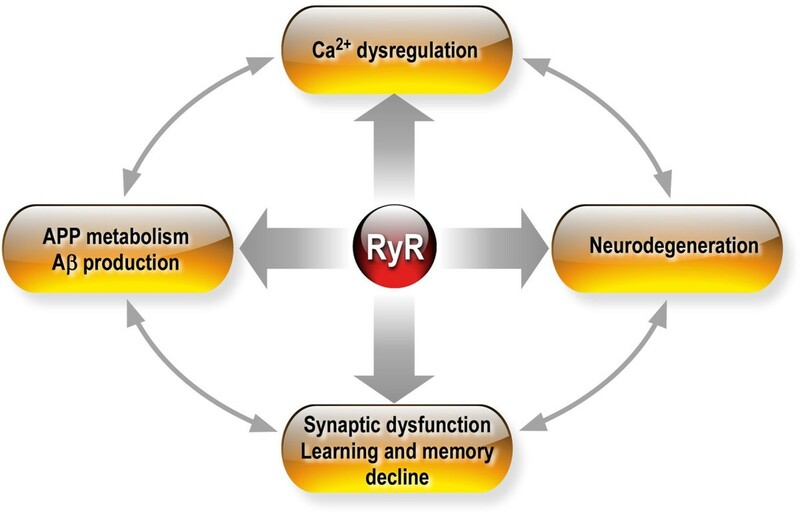 Finally, we review recent publications showing that drug-targeting blockade of RyR and genetic manipulation of RyR reduces Aβ production, stabilizes synaptic transmission, and prevents learning and memory deficits in various AD mouse models. Chemically-designed RyR “modulators” could therefore be envisioned as new therapeutic compounds able to delay or block the progression of AD. Alzheimer Disease (AD) is the most common type of dementia characterized clinically by progressive deterioration of cognitive functions including memory, reasoning, and language . Neuropathological hallmarks of the disease include extracellular amyloid plaques mainly composed of a set of hydrophobic peptides referred to as β-amyloid peptides (Aβ) aggregates and intracellular neurofibrillar tangles (NFT) composed of hyperphosphorylated microtubule-associated tau protein [2–4]. Aging is the major risk factor for the most common late-onset cases AD. However, a significant number of aggressive cases generally characterized by an earlier onset are inherited in an autosomal dominant manner (FAD) [5, 6], and caused by mutations on the β-Amyloid precursor protein (βAPP, the precursor of the Aβ peptides)  and on presenilins (PS1 and PS2) (catalytic core components of the βAPP cleaving enzyme γ-secretase [2, 3]) (Figure 1). Interestingly, both mutations in PS1-2 and βAPP proteins either modify the nature of Aβ peptides and/or affect the levels of their production [8, 9]. 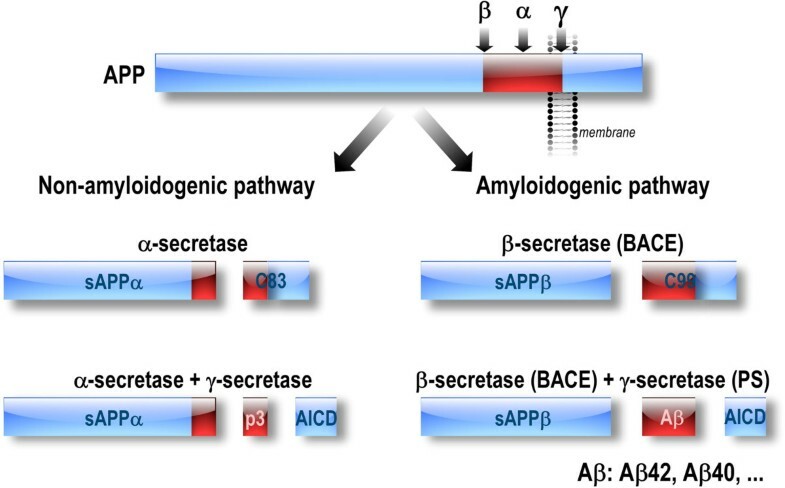 Amyloidogenic and non-amyloidogenic pathways of β amyloid precursor protein (βAPP) processing. Aβ peptides are derived from the processing of the βAPP through the amyloidogenic pathway, implicating β-secretase (BACE1) and γ-secretase complex (composed of PS1 or PS2, Nicastrin, anterior pharynx-defective-1 (APH-1), and presenilin enhancer-2 (PEN-2)). Aβ production is abolished when βAPP is processed through the non-amyloidogenic pathway implicating α-secretase and γ-secretase complexes. Calcium (Ca2+) is a ubiquitous signal transduction molecule. It plays a key role in the modulation of neuronal activity and is involved into a wide array of cellular signals regulating various critical processes, such as cell growth, differentiation, metabolism, exocytosis, and apoptosis . In neurons, the elevation of cytosolic Ca2+ concentration ([Ca2+]i) triggers the release of neurotransmitter at synaptic junctions and contributes to dendritic action potential, regulates the activity-dependent changes in gene expression, as well as synaptic plasticity . Cytosolic Ca2+ levels are kept in a very low range (≈100 nM) compared with the levels present in the extracellular space (≈2 mM) or inside intracellular stores (≈100-500 μM), where the endoplasmic reticulum (ER) represents the major dynamic Ca2+ intracellular pool . Neuronal Ca2+ signaling implicates a complex interplay between Ca2+ entry through the plasma membrane and release from the ER (Figure 2). The ER is a continuous and highly motile network distributed throughout the neuron within dendrites and dendritic spines, axons and presynaptic nerve terminals, as well as in growth cones  and supports diverse functions within each of these cellular compartments . Thus, in dendrites, ER Ca2+ release is involved in modulating postsynaptic responses and synaptic plasticity ; in axon terminals, it is involved in vesicle fusion and neurotransmitter release ; in the soma, it is coupled to the activation of Ca2+-sensitive signaling pathways such as kinase and phosphatase activities ; and in the perinuclear space, it can trigger gene transcription . Ca2+ mobilization from the ER is also important in growth cone activity involved in the formation of new connections and/or the strengthening of preexisting connections that occur during learning and memory in the adult brain . Neuronal Ca 2+ signaling. Cytosolic [Ca2+]i rises are the result of an influx across the plasma membrane via voltage-gated Ca2+channels (VGCCs), ionotropic glutamate receptors (N-Methyl-D-Aspartic acid receptors, NMDARs; and alpha-amino-3-hydroxyl-5-methyl-4-isoxazole-propionate, AMPARs), and the release from the ER through the inositol 1,4,5-trisphosphate (IP3R) and the ryanodine (RyR) receptors. Intraneuronal Ca2+ compartmentalization, is also maintained by the activity of Ca2+-binding buffering proteins (e.g., calbindin and parvalbumin), and regulated within signaling microdomains which involve, ATP-dependent Ca2+ pumps SERCA (Sarco-Endoplasmic Reticulum Ca2+ ATPase) accumulating Ca2+ from the cytosol to ER, and the sodium-Ca2+ exchanger (Na+/Ca2+), which act together with PMCA (Plasma Membrane Ca2+ ATPase) to restore [Ca2+]i back to resting levels by extruding Ca2+ from the cytosol to the extracellular space. Although much of the Ca2+ entry into neuron is predominantly mediated by plasma membrane channels, IP3R- and/or RyR-mediated Ca2+ release can be subsequently recruited via the phenomenon of Ca2+-induced Ca2+ release (CICR), a regenerative process in which Ca2+ enhances its own release from IP3R and RyR. The hypothesis that Ca2+ homeostasis perturbation could play a pivotal role in cascading events to AD was introduced more than 20 years ago . Data obtained from experiments on dissociated cells, brains slices, and more recently and importantly on live AD animal models confirmed this hypothesis [20–23]. Data are now converging to demonstrate the important role of ER Ca2+ deregulation in AD [24, 25]. In this review, we will specifically highlight how primary alterations of the expression and function of the ryanodine receptor (RyR) Ca2+ channels may play a key role in the setting of histopathological lesions, alteration of synaptic plasticity, and learning and memory deficits that are associated with the late stages of the disease and how these receptors may interplay with secretases expression and function and βAPP catabolites. RyRs are a family of three known mammalian isoforms: RyR1, RyR2, and RyR3 which are classified as “skeketal muscle”, “heart” and “brain” types, respectively with respect to their major tissue distribution although all isoforms can be found in the brain. Thus, RyR1 is expressed at low levels in cerebellum and Purkinje cells. RyR2 is predominantly expressed in Purkinje cells of cerebellum and cerebral cortex, and in dentate gyrus of the hippocampus. RyR3 has been detected in hippocampal CA1 pyramidal cell layer, the basal ganglia, and olfactory bulbs . RyRs are homotetramers with a total molecular mass of about 2 MDa. Each subunit of the receptor is a compound with a molecular mass of about 565 kDa, with the 4/5 of the channel comprising an huge N-terminal cytoplasmic domain that serves as a scaffold for channel regulators while the remaining domain is in the ER lumen . Ca2+ activates all RyRs at low nanomolar concentrations with RyR1 > RyR2 > RyR3 in term of sensitivity to cytosolic free [Ca2+] [28, 29]. Caffeine and ryanodine are pharmacological modulators of RyRs. Caffeine freely diffuses through the plasma membrane and subsequent cell excitation can be directly monitored by its ability to quench the fluorescence of various Ca2+ sensors in a wavelength-independent manner . All structures of neurons, from soma to dendrites and presynaptic terminals, respond to caffeine. Caffeine induces a [Ca2+]i rise without a requirement for extracellular Ca2+, and the [Ca2+]i elevation is not associated with plasmalemmal Ca2+ movements. Caffeine-evoked [Ca2+]i elevations are sensitive to pharmacological modulators interacting with RyRs or with SERCA pumps. Thus, these [Ca2+]i responses are blocked by ryanodine, ruthenium red, and procaine and disappear after inhibition of SERCA-dependent ER Ca2+ uptake with thapsigargin (TG) or cyclopiazonic acid (CPA) . Caffeine-induced Ca2+ release that is sensitive to TG and ryanodine has even been observed in individual spines of cultured hippocampal neurons, which are rich in RyR . Ryanodine locks the RyR channel to an “open state” at low concentrations (<10 nM) and to “closed state” at higher concentrations (>100 μM) . The activity of RyRs is also inhibited by mM concentrations of Mg2+ and μM concentrations of ruthenium red [32–34]. Dantrolene is well known inhibitor of RyRs. It was first characterized as a skeletal muscle relaxant , and is widely used in anesthesiology practice and in treating malignant hyperthermia (MH) . Dantrolene was described to be bind to amino acids 590–609 of RyR1 isoform, which presumably stabilizes the channel protein, thus providing evidence for a direct action of dantrolene on RyRs [37, 38]. This stabilizing effect inhibits aberrant activation of the channel and prevents excessive Ca2+ release from intracellular stores. Different papers also tend to show that dantrolene binds to the corresponding sequence (amino acids 601–620) of RyR2 [39, 40]. Recent evidence has suggested that dantrolene may ameliorate abnormal RyR2-mediated Ca2+ release associated with heart failure [41–43]. It is worth to mention that the specificity of dantrolene towards RYRs has been debated in a recent review , since azumolene, an equipotent dantrolene analog, inhibits a component of SOCE coupled to activation of RyR1 by caffeine and ryanodine [23, 44]. RyRs are also directly or indirectly modulated by other channels and kinases . Calmodulin (CaM), a 17 kDa Ca2+ binding protein, binds to RyR1 at Cys3635 and to the corresponding region on RyR2, 3578–3603. CaM can either activate or inhibit RyR1 depending on Ca2+concentrations but appears to preferentially inhibit RyR2 [45, 46]. The 12 and 12.6 kDa FK506 binding proteins (FKBP12 and FKBP12.6) known also as Calstabin1 and Calstabin2 bind to, and stabilize the closed state of RyR1 and RyR2, respectively, and are essential for coupled gating of RyR channels . Ca2+/calmodulin-dependent protein kinase II (CaMKII) associates with, phosphorylates, and regulates the activity of RyR in the heart and skeletal muscle . RyRs may also be regulated by Sorcin, a cytosolic Ca2+-binding protein , and by Calsequestrin (CSQ), a low affinity, high capacity luminal Ca2+ buffering protein . Different studies reported that mutations in RyR or alterations in the post-translational modifications of RyRs (i.e. hyper-phosphorylation, -oxidation, and -nitrosylation) can shift RyRs from a finely regulated state to an unregulated Ca2+ leak channel. RyR “leaky” channels alter cell physiology and are associated with different pathological states in muscle and non-muscle cells [51–55]. In vivo imaging of Ca2+ transients in APP/PS1 (APPswe/PS1-ΔE9) mice model revealed that about 20% of transgenic mice dendrites and axons harbor moderate to severe [Ca2+] elevation than wild type mice, and that the severity of Ca2+ overload correlates with the structural integrity of the dendrite or axon. It was suggested that [Ca2+] elevation may depend on the Aβ accumulation since Ca2+ transients were not observed in animals without cortical plaques (i.e. young APPswe and PS1 mutant mice) . Another group reported a more complex alteration of Ca2+ transients in a different AD mice model (APPswe/PS1G384A) by showing a spatial distribution of silent neurons (decreased Ca2+ signals) (29%) and hyperactive neurons (increased Ca2+ signals) (21%) in transgenic mice brain as compared to wild type mice brain. In accordance with the paper by Kuchibhotla et al., they also proposed that the neurons hyperactivity occur near Aβ plaques . Exogenous application of synthetic A&#x03B2; peptides or oligomeric agregates leads to elevated levels of [Ca2+]i [58, 59]. Aβ-mediated changes in [Ca2+]i occur likely through Aβ ion channels incorporation in the cell membrane, changes in membrane permeability, and phosphatidylserine asymmetry [60, 61]. Actually, in addition to promoting influx of extracellular Ca2+ , Aβ oligomers potently evokes Ca2+ signals through its release from the ER [58, 63–65]. Another mechanism underlying Aβ-mediated elevated Ca2+ entry was recently revealed by renner et al. showing that soluble Aβ oligomers accumulation at the synapse recruited mGluR5 thus elevating intracellular Ca2+ . It is important to emphasize that the level of exogenously applied Aβ, used in these studies, is orders of magnitude above physiological levels. Thus, the relevance of Aβ-mediated Ca2+ signaling deregulation is provided in experiments using in vitro and in vivo AD models overproducing endogenously Aβ (see details in item IV). Mutations of PS1 and PS2 had a significant impact on Ca2+ signaling in AD models. Actually, PS may directly alter ER Ca2+ signaling and affect activity and/or expression of many proteins involved in ER Ca2+ signaling deregulation in AD. Several studies showed that PS mutations induce exacerbated IP3R- and RyR- mediated Ca2+ release [67–72], and alter the function of the SERCA pump . This has been documented in fibroblasts isolated from FAD patients, in cellular systems expressing wild type and mutated PS and in hippocampal and cortical neurons of AD mice [67, 68, 70–72]. PS were also shown to support ER Ca2+ leakage [74, 75], likely through their function as low conductance, passive ER Ca2+ leak channels, independently of their γ-secretase activity [74, 76–79]. Even if PS-mediated ER Ca2+ leak was recently debated [80, 81], recent data obtained by other laboratories and using different systems tend now to confirm the leak function of PS [82, 83]. Other studies have identified &#x03B2;APP-mediated changes to ER Ca2+ signaling related to Amyloidogenic processing of βAPP. Decreased production of sAPPα (soluble APPα fragment: derived from non-amyloidogenec processing of βAPP) (Figure 1), was shown to activate K+ channels . The transcription regulatory factor AICD (APP intra-cellular domain: derived from both amyloidogenic and non-amyloidogenic βAPP processing) (Figure 1) may affects Ca2+ hormeostasis by regulating the expression of genes involved in Ca2+ homeostasis [85–87], namely the transient receptor potential cation channel subfamily C member 5 (TRPC5), a component of receptor-activated nonselective Ca2+ permeant cation channel . Additional studies support the physiological role of βAPP in Ca2+ homeostasis by demonstrating that βAPP downregulation enhances both Ca2+ content of the ER and acidic stores and the dynamics of store operated Ca2+ channel activity . As for PS, βAPP FAD mutations were also shown to alter Ca2+ signals. It has been documented that fibroblasts from AD patients harboring the Swedish double mutation (βAPPswe: βAPPK670N/M671L) showed reduced bombesin-induced intracellular Ca2+ elevations compared to controls while all other pools of Ca2+ were unaffected . Primary cortical neurons from TgCRND8 mice carrying combined βAPPswe and Indiana (βAPPV717F) mutations show elevated ER release of Ca2+ . In accordance with these findings, we recently reported a global alteration of Ca2+ homeostasis in human neuroblastoma SH-SY5Y cells overexpressing human wild type βAPP or βAPPswe. This Ca2+ alteration is manifested by an increase in cytosolic Ca2+ signals associated to enhanced ER Ca2+ passive leakage, and large IP3R- and RyR-mediated Ca2+ release as compared to control cells, and to increased VGCC permeability to Ca2+ . Several studies addressed the role of RyR-mediated Ca2+ disruptions in AD models (Table 1). It was shown that the RyR blocker dantrolene reversed carbachol-induced elevation of Ca2+ release in human neuroblastoma SH-SY5Y cells expressing PS1 mutants (PS1M146V, and PS1L250S) . Accordingly, it was also reported that the RyR agonist caffeine evoked larger Ca2+ liberation in primary cultured neurons derived from the triple transgenic mice model 3xTg-AD (knock in for the mutated PS1M146V, and overexpressing mutated βAPP and microtubule-associated tau protein (PS1M146V/APPswe/tauP30IL)), and the transgenic knock in mice model expressing mutated PS1 (PS1M146V) . Increased RyR channel function was further confirmed in PC12 cells expressing wild type PS1, PS1L286V, PS1M146V or PS2N141L mutants [95, 96]. Interestingly, RyR-mediated ER Ca2+ homeostasis deregulation in AD was supported by the finding showing that exacerbated IP3R-evoked Ca2+ signals in the PS1M146V- and the 3xTg-AD-derived neurons occur through increased RyR-mediated CICR (Ca2+-induced Ca2+ release) (Figure 2) . Studies by the group of Bezprozvanny postulated that the large RyR-mediated Ca2+ release observed in the 3xTg-AD-derived neurons is likely associated to the impairment of PS Ca2+ leak channel function and to increased ER Ca2+ pool . The emerging hypothesis form these studies is that RyR function alteration may be intimately linked to PS. However, experiments using the PScDKO mice model (PS1 and PS2 conditioned double knockout mice) lead to controversial conclusions [78, 97]. While the group of Bezprozvanny showed that primary neurons derived from PScDKO mice harbor increased ER Ca2+ pool and increased RyR-mediated Ca2+ signals , a recent study by Wu et al. showed that neurons derived from the same study model did not harbor alteration in ER Ca2+ content and rather display reduced RyR agonist-induced Ca2+ release from the ER and RyR-mediated synaptic responses . Furthermore, the authors demonstrated that knockdown of RyR expression in wild-type hippocampal neurons mimics the defects observed for Ca2+ homeostasis and presynaptic function in PScDKO neurons . These data further support previous results demonstrating a physiological role of PS in synaptic plasticity [98, 99], and that inhibition of RyR function mimics and occludes the effects of PS inactivation and intracellular Ca2+ homeostasis and synaptic dysfunction . Abbreviations: [Ca 2+ ] calcium signals are depicted as ↑ (increased), ↓ (reduced), or ↔ (unchanged) as compared to respective controls, (*) study was performed on acute brain slice preparation isolated from transgenic mice at different ages (6 weeks (w), 6 months (mo) and 1.5 years (Y), vs versus, KI knock in, Tg Transgenic, wt Wild type, PScKO Tg mice are conditionally double knock out for PS1 and PS2, Tg2576 mice express the βAPP harboring Swedish double mutation (APP K670N / M671L ), 3xTgAD mice are generated from the PS1M146V KI mouse overexpressing APPswe and TauP130L. These studies may outline a possible regulation between RyR and PS towards ER Ca2+ homeostasis. However, the mechanisms underlying this regulation are still unraveled and the basis of the contradictory results in PSDKO cells is not clear. Another question emerging in “AD Ca2+ hypothesis” is the real impact of PSs versus PSs-mediated βAPP processing and Aβ peptides production in Ca2+ disturbances in AD models. To answer this question, in a recent study, Kipanyula and colleagues used two transgenic mice models carrying the FAD-linked PS2N141L mutation either alone or in the presence of βAPPswe mutation (PS2-APP) . They reported in both PS2N141L and PS2-APP transgenic neurons a similar reduction in ER Ca2+ content and decreased response to IP3-generating agonists, albeit increased Ca2+ release induced by caffeine and increased Ca2+ excitability. Further experiments lead authors to postulate that enhanced response to caffeine in both models resulted from the increased level of RyRs observed in brains and cultured neurons derived from both transgenic mice as compared to wild-type mice . The comparative analyses of both transgenic mice models lead authors to hypothesize that Ca2+ stores deregulation depend directly on the mutant PS2 itself and not on PS2-dependent APP processing or total Aβ levels (i.e. larger Aβ level was detected in PS2-APP mice as compared to PS2 mice) . However, it may be argued that the Aβ increase observed in PS2 transgenic mice models may be sufficient to cause the Ca2+ alterations and that the additional larger Aβ rise observed in the PS2-APP mice have no additional effect. In this scenario, RyR dysfunction in PS2 and PS2-APP mice may also likely and predominantly dependent on a direct interaction of PS2 mutant with RyR. Importantly, the real impact of Aβ and of βAPP overexpression and mutation on ER Ca2+ signaling and particularly on RyR dysfunction was revealed in AD-related study models independently from PS mutation or overexpression [64, 86, 91, 92, 103, 104]. Regarding βAPP overexpression and mutation, it has been documented that primary cortical neurons isolated from TgCRND8 mice (described above) display elevated RyR-mediated Ca2+ release, while global Ca2+ handling remained unaffected . Accordingly, we recently highlighted a fundamental role of increased RyR-induced Ca2+ release in SH-SY5Y neuroblastoma cell line stably overexpressing either wild-type or mutated human βAPP (APP695 or APPswe respectively), and in primary neurons from APPswe-expressing mice (Tg2576) . Of most interest, it was also reported that exogenous Aβ oligomers may stimulate RyR-mediated Ca2+ release in wild type hippocampal neurons , and that application of soluble Aβ caused a marked increase in RyR activity, resulting in a 10-fold increase in channel open probability which was blocked by RyR antagonist ruthenium red . The alteration of RyR expression in AD-affected brains was first described in 1999 by Kelliher et al. , who showed that [3H] ryanodine binding (indicative of RyR expression protein) is elevated in hippocampal regions (subiculum, CA2 and CA1) of human post-mortem tissue at early stages of the disease, i.e. prior to extensive neurodegeneration and overt Aβ plaque deposition . Recently another paper reported elevated RyR2 mRNAs levels early in mild cognitive impairment derived brains . Accordingly, altered RyR2 expression was recently reported in a preliminary study of the whole-genome expression profile of sporadic and monogenic early-onset AD  (Table 2). Abbreviations: (*) AD stage is defined following BRAAk’s staging for human AD post-mortem brains, and is referred in weeks (W), months (mo) or years (Y) in AD mice models, (**) RyR expression (mRNA or protein level) is depicted as ↑ (increased), ↓ (reduced), or ↔ (unchanged) as compared to respective controls, PS presenilin, MCI mild cognitive impairment, KI knock in, Tg transgenic, Wt wild type, CRDN8 Tg mice express human APP with a double mutation (APPK670N/M671L + APPV717F), PScKO Tg mice are conditionally double knock out for PS1 and PS2, Tg2576 mice express the Swedish double mutation (APP695K670N/M671L), 3xTgAD mice are generated from the PS1M146VKI mouse overexpressing APPswe and TauP130L. Interestingly, alteration of RyR expression was reported in different AD study models and was shown to be linked to Aβ and/or overexpression of PS mutants. Thus, increased expression of RyR3 but not RyR1 or RyR2 was observed in cortical neurons isolated from C57Bl6 mice upon extracellular Aβ42 application , and in cortical neurons and brain tissue from TgCRND8 mice . We recently showed that RyR protein and mRNAs levels are increased in neuroblastoma SH-SY5Y cells overexpressing wild type βAPP or βAPPswe and in Tg2576 mice as compared to respective control mice  (Table 2). Increased RyR expression was also largely reported in AD models where PS is overexpressed or mutated. Elevated RyR mRNAs and protein was first reported in in vitro models expressing PS1 mutants . Importantly, RyR expression increases throughout the lifetime of the PS1M146V, and the 3xTg-AD transgenic mice [72, 94, 100]. Recent findings of Liu et al. further support these observations by showing increased expression of both RyR2 and RyR3 in APPswePS1L166P transgenic mice . It was proposed that the induction of RyR expression is a compensatory event linked to the loss of PS leak function . This hypothesis was recently debated in a study using PSDKO mice model, where authors revealed that the absence of PS, on the contrary, triggers an hippocampal reduction of RyR protein levels . The basis of the contradictory results about RyR expression in AD models may be linked to a variable regulation of RYR along AD pathology development and between brain areas. As a matter of fact, reduction of RyR2 and RyR3 mRNA levels and RyR2 protein expression was observed upon treatment with sublethal concentrations of Aβ oligomers . Kelliher, M. et al. also reported a complex regulation of RyR expression in human AD brains where RyR expression was shown to be elevated in hippocampal regions in cases with early neurofibrillary pathology and reduced in the subiculum, and CA1-CA4 regions of the late stages  (Table 2). The molecular mechanisms that could underlie the regulation of RyR expression in AD are still unknown. ER stress is induced during AD, and has been indirectly implicated as a mediator of Aβ neurotoxicity . In this context, it was demonstrated that Aβ triggered the activation of the ER stress response factor X-box binding protein 1 (XBP1), thereby yielding its transcriptionally spliced active form XBP1s. XBP1s showed neuroprotective activity towards Aβ oligomers through a reduction of cytosolic Ca2+ and of the expression of RyR3 . Human and murine RyR3 contains multiple XBP1s binding sites . It is however still unclear whether the regulation of RyR3 by XBP1 is direct or indirect. Additional work is necessary to demonstrate these observations. In many cases, the adverse effects of PS mutations on Ca2+ homeostasis were associated to RyR channels activity alteration. However, the molecular mechanism underlying this regulation is not fully understood. Nevertheless, RyRs were shown to co-localize with PSs at the ER membrane . Co-immunoprecipitation experiments also unraveled a physical interaction between PS1-2 and RyR2 [95, 96, 115]. The laboratory of Peter Koulen further investigated the possible physical interaction of PS with RyR and studied in vitro the impact of such interaction on RyR channel activity. In two different studies, they demonstrated that PS1 and PS2 N-termini fragments strongly increased both mean currents and open probability of single brain RyR channels [116, 117]. They proposed that PS1 NTF (1–82) and PS2 NTF (1–87) may interact with the cytoplasmic side of RyR and allosterically potentiates RyRs in a Ca2+-dependent manner [116, 117]. Another group demonstrated the molecular interaction of the large hydrophylic C-terminal region of PS2 with sorcin, a modulator of RYR channel, in human derived neuronal cell line and in brain tissues. Their data also suggested that PS2/sorcin interaction is potentiated by Ca2+ . This observation was further confirmed in another cellular system where PS2, sorcin, and RyR2 were shown to physically interact (in a Ca2+ dependent manner) in both HEK-293 cells overexpressing these proteins and in mouse hearts . All together this set of data demonstrates that PS may play an important role in RyR channel activity directly through the interaction of PS with RyR and indirectly through the interaction of PS with RyR modulators. However, the implication of such RyR channel function regulation by PS for AD remain to be elucidated (i.e. study of PS1-2 mutants physical interaction with RyR and the potential effect of such interactions on RyR channel activity). Enhanced RyR-mediated ER Ca2+ depletion may be linked to pathophysiological post-translational modifications in the macromolecular complex containing RyR1 or RyR2 resulting in “leaky channels” . Interestingly, post-translational modifications of RyR2 were reported in cerebral ischemia  where endogenous RyRs undergo S-nitrosylation and S-gluthathionylation processes that resulted in high activity channels and ultimately lead to cortical neuronal death . Disrupting function of FKBP1b, a RYR2 stabilizer, was recently shown to alter Ca2+ homeostasis in hippocampal neurons and to trigger the aging phenotype of Ca2+ deregulation in young animals (i.e. enhanced ryanodine sensitive AHP “after hyperpolarization” signals, and increased CICR from RyR) . Recently, Liu et al. described the contribution of “leaky” RyR2 to stress-related memory impairments . Through a series of biochemical, neurophysiological, and behavioral assays, the study demonstrated that chronic stress can affect RyR2 function through PKA hyperphosphorylation, oxidation, and nitrosylation leading to the physical dissociation of FKBP12.6/1b (calstabin2) and RyR2, thereby inducing Ca2+ leak from RyRs and cognitive dysfunction . Post-translational modifications of RyRs in AD have not been reported yet. However, AD brains manifest excessive generation of reactive nitrogen (RNS) and oxygen (ROS) species, contributing to neuronal cell injury and death via a series of redox reactions [121–123]. In addition, PKA activation was shown to be implicated in AD through the regulation of βAPP processing [124–126], Aβ-mediated cell death in vitro and in vivo [127, 128], and oxidative stress. It is intriguing to note that RyR hyperphosphorylation is largely linked PKA activation [55, 129]. Interestingly, a microarray analysis performed on CA1 hippocampal gray matter of Alzheimer and control subjects revealed the correlation of a down regulation of the expression of RyR stabilizers namely, FKBP1a with incipient AD, suggesting an additional mechanism involved in RyR dysfunction in AD . All over, these observations must stimulate the initiation of dedicated studies investigating the influence of RyR destabilization in the onset and/or progression of AD. It was reported that Ca2+ homeostasis may influence βAPP pathophysiological processing. Thus, Aβ production is enhanced by elevation of intracellular [Ca2+]i [131, 132] and RyR-mediated Ca2+ release , and is reduced in IP3R-deficient lines . Of particular interest, we showed that dantrolene-induced lowering of RyR-mediated Ca2+ release leads to the reduction of βAPP cleavage by β- and γ-secretases and decreases both intracellular and extracellular Aβ load in wild type βAPP- or βAPPswe- overexpressing neuroblastoma cells as well as in primary cultured neurons derived from Tg2576 mice brain. We also demonstrated that this Aβ reduction could be accounted for by decreased Thr-668-dependent βAPP phosphorylation and lowered β- and γ-secretases activities . Importantly, we and other laboratories showed that dantrolene diminishes Aβ load, and reduces Aβ-related histological lesions in three different AD mice models (Tg2576, 3xTg-AD and PS1M146V/APPswe), demonstrating that subchronic blockade of RyR activity may be beneficial in the context of AD [92, 134, 135]. On the contrary, long-term feeding of dantrolene was shown to increase Aβ load in APPswePS1L166P transgenic mice . Discrepancies in the above-described data may rely on the kinetics of AD-like set-up and progression as well as the duration of RyR blockade specifically linked to various models examined. These puzzling results may also point out a possible dual protective/compensatory versus pathogenic role of RyR at different stages of the development of AD. The recent paper by Bezprozvanny’s group sheds new lights on this complex dual role of RyR in the development of AD . Authors used a genetic approach to modulate RyR expression along AD development in APPswePS1L166P mice and generated APPPS1xRyR3−/− mice as a study model. They demonstrate that the deletion of RyR3 in young APPPS1 mice elevates Aβ accumulation, and increases hippocampal neuronal network excitability thus accelerating AD pathology. In contrast, the deletion of RyR3 in older APPPS1 mice reduces Aβ plaques, and rescues the network excitability and the loss of mushroom spines . All together, these studies suggest a complex dual role of RyR in AD pathology. RyR may function as a compensatory/protective actor at early disease stages, and acts as a pathogenic molecular determinant contributing to the setting of histopathological lesions and synaptic deficits observed at the late disease stages. RyR-mediated ER Ca2+ release leads unequivocally to large cytosolic Ca2+ signals. Thus, it could be postulated that enhanced RyR-mediated Ca2+ release may be indirectly implicated in neuronal death through cytosolic Ca2+ overload. Indeed, pharmacological targeting of RyR by its specific inhibitor, dantrolene suggested that this receptor could play a direct role in neurodegeneration. Popsecu et al. showed that dantrolene protected neurons against kainic acid-induced apoptosis in vitro and in vivo . Neuroprotective effect of dantrolene was also reported in cerebral ischemia [137, 138], and in different neurodegenerative diseases such as Huntington’s disease [139, 140], and spinocerebellar ataxia of types 2 and 3 [141, 142]. Dantrolene was shown to reduce the glutamate-induced increases in intracellular [Ca2+], and protects against glutamate-induced neurotoxicity . Complete block of glutamate toxicity by dantrolene was also observed in the absence of extracellular Ca2+, which indicates that Ca2+ release from intracellular stores is essential for the propagation of glutamate-induced neuronal damage . Related to AD, intracellular Ca2+ levels were increased in cells expressing the human PS1L286V mutation. Aβ induced cell death in these cells and dantrolene protected the cells against these deleterious effects . Imaizumi et al. showed that treatment of rat cortical neurons with Aβ increased the expression DP5, a neuronal apoptosis-inducing gene . Induction of DP5 gene expression was blocked by dantrolene suggesting that the induction of DP5 mRNA occurs downstream of the increase in cytosolic Ca2+ concentration caused by Aβ. Moreover, DP5 specifically interacts with Bcl-xl during neuronal apoptosis following exposure to Aβ, and its binding could impair the survival-promoting activities of Bcl-xl . Accordingly, dantrolene treatment protected PC12 cells expressing PS2N141L mutant from death induced by L-glutamate and Aβ toxic peptides . The direct implication of RyR in neuronal death was also proposed by Supnet et al. who showed that suppression of RyR3 expression in TgCRND8 neurons, increased neuronal death [91, 147], thus supporting a protective role of RyR in the late stages of AD pathogenesis, at least in this mice model. According to this, other studies highlighted a potential protective role of RyR in AD models. Thus, long-term pharmacological blockade of RYR with dantrolene in APPswe/PSL166P mice resulted in the loss of synaptic markers, and neuronal atrophy in hippocampal and cortical regions . Based on these results, one could assume that alteration of RyR-mediated Ca2+ signals along AD pathogenesis progression may shift cell behavior from a protective/adaptive response to a pro-apoptotic phenotype. Dantrolene-mediated neuroprotection may accur via the modulation of Ca2+-dependent proteases and kinases. Thus calpain, CaMKII, PKA, and MAPK that are all activated by cytosolic Ca2+ control the transcriptional activation of immediate early and memory genes [148, 149]. It is noteworthy that the activated form of calpain2 is increased in neuritis and neurons at risk for developing neurofibrillary pathology and is extensively bound to neurofibrillary tangles in brain AD patients . Interestingly, calpains inhibition was demonstrated to improve memory and synaptic transmission in AD models . Calcineurin (Ca2+/calmodulin-dependent serine/threonine phosphatase) induces endocytosis of NMDA receptors, reduces synaptic currents and activates propoptotic molecules such as BAD . Remarkably, Dinely et al. also reported that calcineurin is upregulated in the brain of Tg2576 mice model , and that the calcineurin inhibitor FK506 prevents the loss of mitochondrial potential induced by Aβ by preventing cytochrome C release from mitochondria . 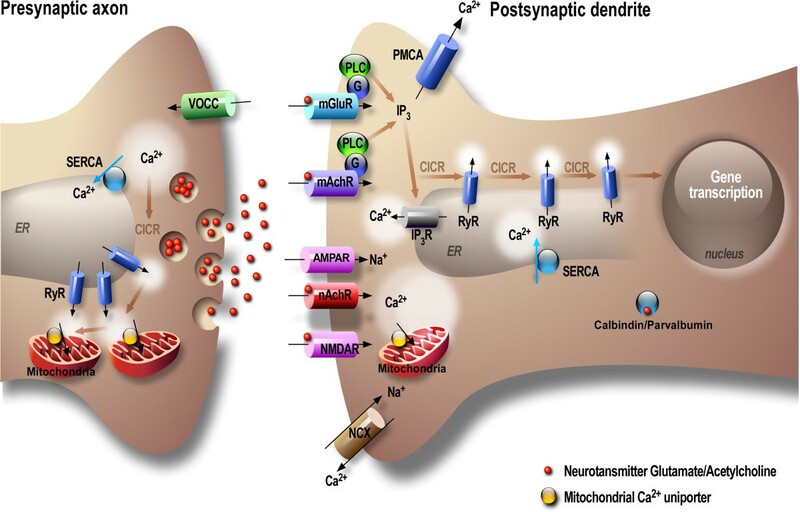 Certain forms of Ca2+-dependent synaptic plasticity, including long-term potentiation (LTP) and long-term depression (LTD), are thought to underlie the cellular/molecular mechanisms of learning and memory . High concentration spikes of Ca2+ activate LTP. Information placed in this temporary memory is uploaded and consolidated in more permanent memory stores during certain phases of sleep. During another phase of sleep, smaller elevation in Ca2+ activates the LTD.
Pre-synaptically, CICR waves through the RyR trigger neurotransmitter release that is detected as a temporary depolarization of postsynaptic membrane potential (miniature postsynaptic potentials) . CICR evoked by voltage-dependent Ca2+ entry can mobilize neurotransmitter vesicles from the reserve pool to the readily releasable pool and thus facilitate subsequent vesicle release . This Ca2+-dependent release has implications for short-term forms of presynaptic plasticity known as paired pulse facilitation (PPF) [102, 155]. Post-tetanic potentiation (PTP) (another form of presynaptic plasticity that occurs following a high frequency stimulus) is also thought to involve residual Ca2+ elevation that results from RyR-mediated Ca2+ release [155, 157]. Post-synaptically, ER Ca2+ is involved in long- and short-term plasticity. Long-term changes in synaptic efficacy and plasticity depend on the combination of channels recruited in dendritic spines . For example, NMDAR mediated-Ca2+ entry into spines and dendrites is essential but not sufficient for the induction of LTP [156, 159]. ER Ca2+ stores can amplify the initial NMDAR-mediated signal and determine the polarity as well as input specificity to activate downstream cascades necessary to encode LTP or LTD . As a matter of fact, blocking IP3R leads to a switch of LTD to LTP and elimination of heterosynaptic LTD, whereas blocking RyR eliminates both LTP and homosynaptic LTD occurring at synapses that are activated, normally at low frequencies [160–163]. Finally, type 3 RyR knockout mice were shown to harbor enhanced LTP and reduced LTD [164, 165]. Ca2+ partly regulates activity-dependent membrane excitability-sensitive K+ channels, such as SK channel, which contribute to the medium after-hyperpolarization (known also as refractory period, where in neuron membrane potential falls below the resting membrane potential). This current underlies spike-frequency adaptation, a phenomenon wherein accumulating Ca2+ entering through spiking activity reaches sufficient levels to activate hyperpolarizing K+ currents and transiently suppress membrane excitability. SK channels are largely activated by VGCC. However, IP3R- and RyR-mediated Ca2+ release were also shown to activate these channels and modify spiking patterns, thereby influencing local circuit activity . Alteration of both RyR expression and function over time could have a significant effect on synaptic function that may contribute to cognitive decline. At the level of neuronal shape, augmented cytosolic Ca2+ leads to a loss of Ca2+ compartmentalization in dendritic spines and to a distortion of neurite morphologies mediated by activation of Ca2+-dependent phosphatase calcineurin . Focusing on the role of RyR-mediated Ca2+ deregulation, Stutzmann’s group provided a large amount of data supporting the major role of RyR expression and function deregulation in synaptic abnormalities in AD mice models [72, 100, 135, 165–168]. They first revealed that IP3-evoked membrane hyperpolarization is driven by Ca2+ liberation through RyR and enhanced coupling efficiency between RyR and Ca2+-activated K+ conductance [72, 165]. Increased RyR-evoked Ca2+ release was shown to occur within synapse-dense regions of CA1 pyramidal neurons of young 3xTg-AD mice and the double transgenic mice co-expressing mutated PS1 and βAPP (PS1M146V/APPswe) and significantly increases the amplitude of spontaneous postsynaptic potentials and the frequency of events responses in 3xTg-AD as compared to non-transgenic neurons [100, 166]. The obtained data also demonstrate that both presynaptic and postsynaptic RyR-sensitive Ca2+ stores contribute to synaptic transmission and plasticity in 3xTg-AD but not in non-transgenic mice [100, 166]. Interestingly, these signaling changes are present before Aβ formation, tau deposits, or memory deficits thus revealing RyR function alteration may represent an early pathogenic process of AD [100, 166]. Recently, by using young 3xTg-AD mice, the same laboratory showed that under control conditions, basal synaptic transmission, PPF and LTP appear similar to the non-transgenic mice. However when RyRs are blocked and enhanced CICR effect was suppressed, the AD neurons demonstrated enhanced basal synaptic transmission and altered short and long term plasticity. This may suggest that RyR-mediated Ca2+ signals have a prominent inhibitory effect in basal synaptic transmission and presynaptic neurotransmitter release in the AD mice [135, 168]. These data were further confirmed by showing that sub-chronic stabilization of ER Ca2+ signaling earlier in the disease process has beneficial effects on synaptic transmission and plasticity abnormalities in presymptomatic 3xTg-AD mice and adult PS1M146V/APPswe double transgenic mouse model, while having little effect in non-transgenic controls [135, 168]. Some evidences suggest that RyR expression levels may have a direct role in behavior and cognitive trait. It was shown that nicotine administration upregulates RyR2 levels in brain areas that control cognitive and motivational systems (notably the cortex and ventral midbrain) . Previous works have shown that RyR mRNA and protein levels in the hippocampus are upregulated in response to spatial learning tasks . In agreement with the role of RyR in synaptic plasticity, it was reported that RyR may play a role in learning and memory. Thus, RyR3 knockout mice exhibit decreased social behavior , and memory retention is accompanied by increased expression of RyR2 mRNA in the hippocampus of water maze-trained rats as compared to swimming controls . In the context of AD, we demonstrated that dantrolene reduced Aβ burden in Tg2576 mice in vivo. The influence of dantrolene on learning and memory decline was studied by means of two complementary tests: the Morris water maze (MWM), which examines spatial memory, and the novel object recognition (NOR) paradigm, which records recognition memory. Both tests revealed alterations of both learning and memory behavior in Tg2576 mice. Chronic treatment with dantrolene does not affect learning ability in wild type mice, but restores learning ability in Tg2576 mice (MWM test), and increased the object discrimination index when compared to vehicle-treated Tg2576 mice (NOR test) . According to these data, Peng et al. showed that chronic treatment with dantrolene reverses memory decline in the 3xTg-AD by using the MWM test . We showed that Tg2576 mice harbor a reduced level of PSD-95 (a component of the post-synaptic density membrane associated guanylate kinase (PSD-MAGUK) scaffolding proteins) . It is well established that PSD-MAGUK indirectly regulates synaptic plasticity and memory through the control of the number and compartmentalization of both AMPA and NMDA glutamate receptors around the PSD (post-synaptic density) . We hypothesized that excessive RyR-mediated Ca2+ release and subsequent increased Aβ load may have contributed to PSD-95 expression decline in Tg2576 mice which may have led directly or indirectly to learning and memory decline. The recently published paper by Liu et al. is in accordance with these findings since genetic depletion of RyR in old APPPS1 mice rescued neuronal network excitability . Obviously, this review reveals RyR as a key molecular determinant in “AD Ca2+ hypothesis”. It also highlights the molecular mechanisms that could influence RyR-mediated Ca2+ release in AD where PS and Aβ emerge as detrminant regulators of RyR expression and function alteration. Altered RyR levels have been described early in human AD cases, in mild cognitive impairment and in various AD models [107, 108]. Accordingly, deregulation of RyR function was reported in diverse in vitro and in vivo AD study models. Data interpretation concerning some controversial results about RyR deregulation in AD must take in consideration the divergence of study systems i.e. : i) simple versus double or triple transgenic mice models; ii) primary cultures neurons and acute hippocampal slices versus neuronal derived cell lines or fibroblasts; and most importantly iii) the time course of “AD pathogenesis” development in each study model. We have also to consider that AD-associated neurodegeneration, synaptic dysfunction and cognitive decline are complex, inter-regulated and long processes where pathological and compensatory phenomenon may occur.Actually, data converge to demonstrate a complex dual role of RyR in AD acting as a potential compensatory/protective paradigm, or as a pathological hallmark amplifying the setting of histopathological lesions and synaptic deficits that are associated with the late AD stages. We provide evidences that RyR interfere with different routes leading to AD pathogenesis development through the amplification of APP metabolism and Aβ peptide production, the control of neuronal death, synaptic structure and plasticity dysfunctions and learning and memory decline (Figure 3). Scheme of the implication of RyR expression and function alterations in AD. 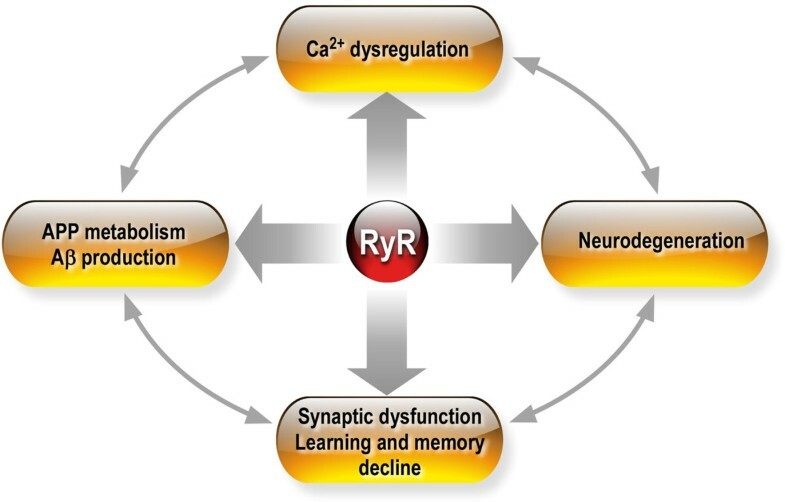 RyR-mediated AD pathogenesis occurs through Ca2+ signaling dysregulation, the amplification of βAPP metabolism and Aβ peptide production, the control of neuronal death and degeneration, synaptic dysfunction, and learning and memory decline. The functional cross talk between these AD “pathological hallmarks” places RyR at the crossroads of AD pathogenesis. About 30 millions individuals are estimated to be affected with AD worldwide and to date no effective treatment exists to arrest disease progression. Therapeutic approaches targeting Ca2+ influx have demonstrated efficacy in animal AD models but very few have been successful in clinical trials [174, 175]. Targeting of ER Ca2+ homeostasis could be an additional therapeutic approach that merit testing. Data described above demonstrate that RyR could be envisaged as a potential new target. Therefore, we believe that it is of most interest to develop and test new RyR modulators with high specificity and affinity for RyR bioavailability as new therapeutic tools in AD. This work was supported by INSERM, CNRS, «Fondation pour la Recherche Médicale» (DEQ20071210550) and LECMA (Ligue Européenne Contre la Maladie d’Alzheimer to MC). This work has been developed and supported through the LABEX (excellence laboratory, program investment for the future) DISTALZ (Development of Innovative Strategies for a Transdisciplinary approach to Alzheimer’s disease). We acknowledge fellow support from BrightFocus foundation to D.D.P. DDP drafted the first version of this review. MC and FC revised the manuscript for intellectual content. All authors read and approved the final manuscript.